Often, we managers learn from HR or management blogs written by HR Tech vendors who sell employee engagement software and it can get a little old. After all, what do they know that practitioners don’t know? Since there’s so much noise from employee engagement articles out there, it can be hard to find practical, actionable suggestions to increase employee engagement at your company. We know we have a lot of great information on the topic, here at Red Branch (check out our Instagram, we’re the MOST engaged), we’ve also been inspired by others. To help you sift through the chatter and the noise, we’ve compiled a list of some of the best employee engagement articles, tips, suggestions written over the last few years. Read through. We guarantee you’ll leave this article with at least one amazing idea to implement in your workplace today (okay or tomorrow). One of my most popular talks on the conference circuit, this explains how you can trace solid employee engagement all the way back to your sourcing and recruitment team. If you thought you were the only one responsible for creating engaged, invested employees, think again! Recruiters can help with employee engagement too! Sometimes the employee is responsible for moving their engagement up the ladder but recruiters are responsible for finding employees. Here’s how to help your recruiters spot the bad apples who may never be happy in your workplace. I promised you actionable tips right? Here they are. From showing interest in their personal lives to providing informal corporate training, these are employee engagement tips that don’t cost a lot of time or money! Here Kerry Pivovar tackles employee engagement from a “do as I do” standpoint. If you’re the type of person who likes to emulate what others are doing and adapt it to your workforce, this is a great article to peruse. Go ahead! Find your employee engagement mentor. Don’t have a huge employee engagement budget? Noelle Murphy gives you more than two handfuls of ideas that are cheap to FREE to do and will increase employee engagement too! You don’t have to be an F500 to have employee engagement like one. Here are the 4 employee engagement secrets that makes these companies shine. Try them in your workplace. Prefer to listen while you learn? This podcast by moi might be a little bit echo-y but it’s still chock full of smackdown. Listen as I tell you why employee happiness and employee engagement are not synonymous and how to attain (hopefully) both. Kerry Pivovar breaks down why being happy at work is important and how you can make it happen for you. While employee engagement and employee happiness aren’t the same thing, wouldn’t it be nice to have both? Don't Have the Time to Read the Whole Guide Right Now? No problem! Download the pdf version of this guide right here. This GIF-happy post dives into what you can learn from the movies, performance and engagement. The title says it all but what do you do when you find out you have a bad apple? Here’s how to spot them and deal with them so disengaged employees don’t wreck your company. While this article was written in 2013, the ideas it proposes still ring true today (even if that stat has gone down a bit). Posted on Recruiter.com, this article takes you through what to do when passion fades in the workplace. Need proof and research to support your ideas about engaging your employees? Here you go! In this stats brief you’ll find both stats to make you laugh, cry and shudder AND ideas to help you turn your company into a shining example of employee engagement rather than…well, just another stat. Maybe you don’t spend that much time onboarding OR you might be an HR department of one, handling recruiting, onboarding and management. Either way, this missive by Kerry Pivovar is an excellent read. If you’re trying to increase engagement, the best place to start might be at the very beginning. Wondering how to bring that new employee out of his or her shell? Employee engagement starts before day one, so try this handy list of “get to know you” questions. Sometimes what you don’t do is as important as what you do…do. In this article, we talk about what not to do when implementing an employee engagement plan (because let’s be honest, they’re never quite done). Is everyone sick of this content by now? Too bad! But in all seriousness, you might be sick to death of talking about employee engagement because you haven’t gotten off your rear to do anything about it! This article will give you some BIG steps to take to (finally!) make it happen. Employee Engagement: One Size Fits All? Employee engagement means different things to different people so of course, there are going to be some differences in how we go about managing the different generations. This article, originally published on Recruiter.com, tells you how to engage the cynical generation, Gen X.
Here’s how I manage an office full of millennials and don’t lose my mind. Whether you manage one generation, or like most workplaces, you have multiple generations, this is a must-read. Do you have teleworkers or work from home days? It can make your remote workers really happy or really disengaged. Here’s a great post from Jill Phillips about how to keep disengagement at bay, when an employee is far from the office. So what do you think? 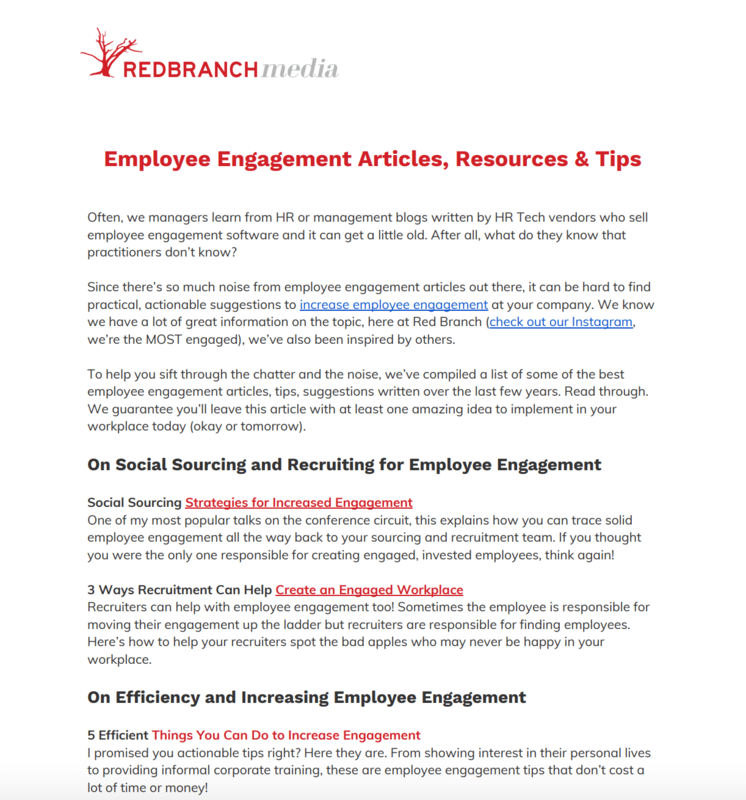 We’re going to keep adding to this page until we’ve compiled the largest collection of employee engagement content out there! What actionable tip did you take from these articles?